A landmarked cottage in Old Town was demolished in 2016 after the city condemned the property. Ald. Brian Hopkins’ plan would put a 10-year hold on any new construction at sites where buildings were ‘willfully’ neglected. WEST TOWN — After seeing too many old Chicago buildings fall into disrepair only to be bulldozed, Ald. Brian Hopkins (2nd) is proposing an amendment to a city ordinance that would punish owners of landmarked homes for neglecting their properties. Hopkins wants to do that by fining owners of structures that have fallen into disrepair up to $2,000 daily and placing a moratorium on new construction at the site for up to 10 years, according to an ordinance he plans to introduce next Wednesday to members of the Committee on Zoning, Landmark and Building standards. If the proposed ordinance, which aims to amend the 1997 Chicago Landmarks Ordinance, passes in the subcommittee, it will go before the full City Council for a vote on April 18. “It strengthens the penalties for owners of landmarked buildings who intentionally allow them to fall into a state of disrepair, so they can come back to us and apply for a demolition permit and say ‘Well, the building is a hazard, look at the condition of it; it’s about to fall down anyway,’” Hopkins told members of the East Village Association at the neighborhood group’s monthly meeting on Monday at Happy Village, 1059 N. Wolcott Ave. The measure would impose a daily minimum fine of $1,000 to $2,000 on owners of deteriorating structures who have crumbling foundational elements––such as sagging walls and leaning beams–– or improperly attached signage. 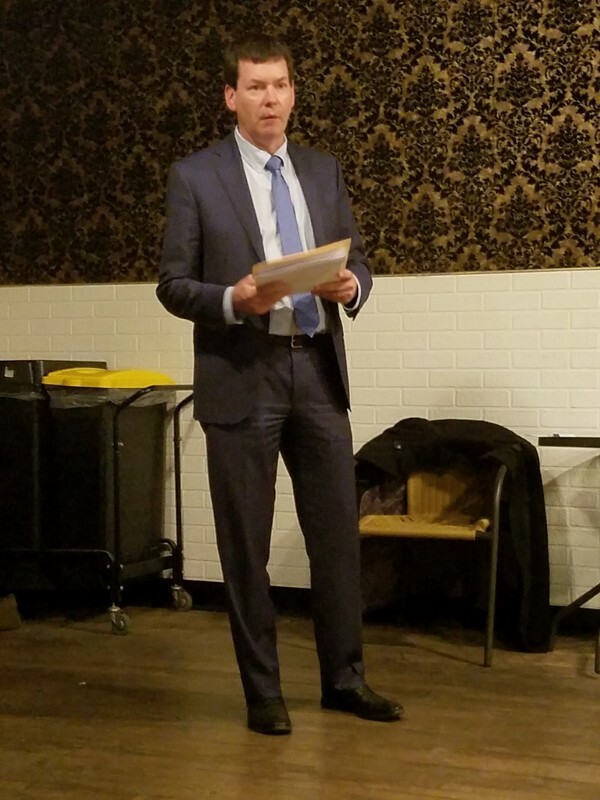 Hopkins told members of the East Village Association that the proposed ordinance would limit a property owner’s ability to demolish their buildings. “We will take them to building court and say, ‘whether it’s a Landmark or not, you have to keep up your building,’” Hopkins said. According to the amended ordinance, if building problems are worked out internally through the city’s administrative hearing process overseen by the Department of Buildings, there would be a two-year hold on any new construction or demolition permits. However, if the fight between the city and building owner escalates to the Circuit Court of Cook County, there could be a 10 year moratorium on new construction permits rather than five years under the existing ordinance. There are existing penalties for neglecting buildings in the law passed in 1997, but the amended ordinance strengthens them and explicitly states what issues could be subject to fines. “We are clarifying what constitutes a contributing act of negligence,” Ficara said. Read a draft of the amended ordinance here.